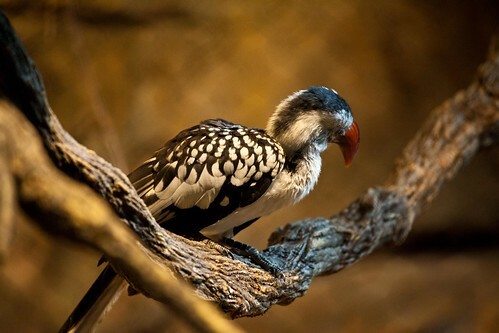 The red-billed hornbill is named for its long, curving, colorful bill. It has a white head and chest with spotted wings and a long brown tail. 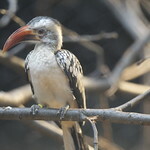 This bird is one of the smaller hornbill species, despite the fact that adults can reach up to 16 inches in length. 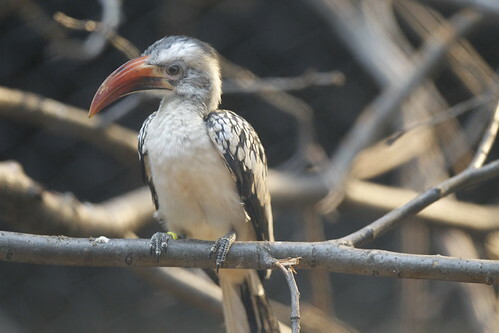 Unlike many hornbills, it does not have a casque on top of its bill. 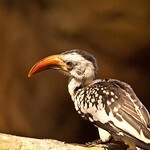 The red-billed hornbill is found through much of sub-Saharan Africa, outside the continent’s central rain forests. 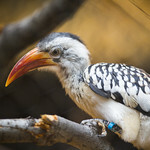 The red-billed hornbill is considered a species of least concern by the International Union for Conservation of Nature. 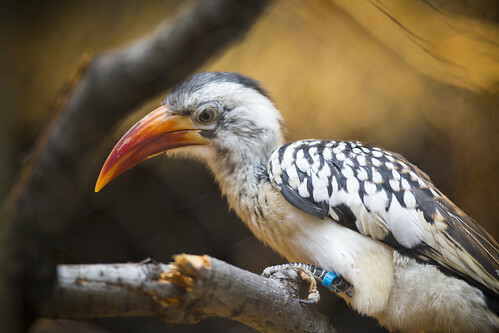 Lincoln Park Zoo participates in the Red-Billed Hornbill Species Survival Plan®, a shared management effort by zoos throughout the Association of Zoos and Aquariums. 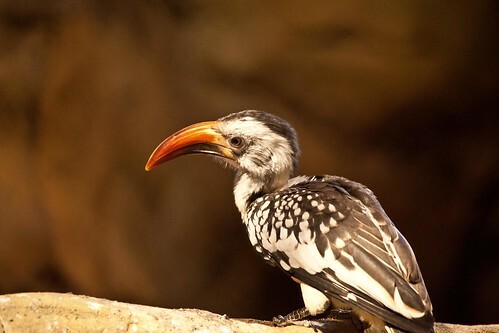 An omnivorous species, the red-billed hornbill uses its long bill to gather fruits, seeds and insects. 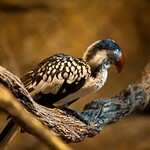 After laying eggs, the female walls herself into a tree hole for incubation and chick rearing. The male continues to bring food to the nest, passing it through a slit in the barrier, which is made of mud, droppings and fruit. The three–five chicks stay in the nest until they fledge, which usually takes six–seven weeks.